These are two of the biggest winners of the internet era, but which one should investors buy now? Netflix (NASDAQ:NFLX) and Facebook (NASDAQ:FB) have become household names over the past two decades, one for its worldwide social network, the other for its industry-busting streaming service. Each has been a boon to investors, too. Since its market debut in May 2012, Facebook has racked up gains of over 425% for investors, while Netflix has soared 2,500% during the same time. Since its IPO in 2002, Netflix has produced life-changing returns of 34,000%. Past performance is no guarantee of future results, and today's investors are more interested in the future. With that in mind, let's look at the two companies side by side to determine which provides a better opportunity if purchased today. 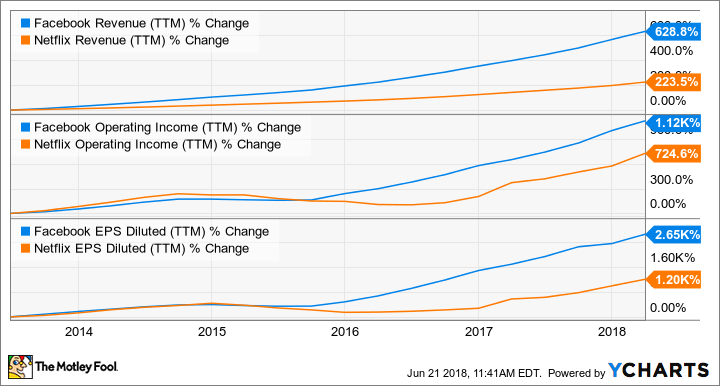 As illustrated in the chart below, Facebook has outpaced Netflix's revenue, operating income, and earnings growth over the past five years. Over the coming five years, however, that picture is expected to change drastically. Netflix's earnings per share (EPS) growth is expected to accelerate to over 63% annually during the next half decade, driven by margin-expanding original content, soaring international growth, and the potential for future price increases. For its part, Facebook's EPS growth is expected to slow to just 26% per year, as advertising saturation of its flagship Facebook platform gives way to slower ad growth on its Instagram, WhatsApp, and Messenger services. Netflix has the advantage when it comes to growth in the coming years, but it's important to note that the expected growth rates are contingent on the cycle of massive content spend attracting equally impressive subscriber growth, and the company achieving overseas what it has accomplished at home. While that is likely to be the case, there could be trouble if that cycle breaks down. When it comes to current financial metrics, Facebook is head and shoulders above Netflix, producing significant cash flow and a rock-solid balance sheet -- which gives the company greater flexibility. Netflix, meanwhile, is borrowing money hand-over-fist and is cash flow negative, as the company builds its library of original content in countries around the globe. Facebook is a much stronger company financially and gets the nod. Since valuation is one of investors' key considerations when evaluating a stock, let's look as several of the most common, including price-to-earnings ratio (P/E), price-to-earnings-growth ratio (PEG), and price-to-sales ratio (PS). As you can see from the above chart, Facebook makes a clean sweep when it comes to valuation metrics. In every metric, lower is better -- and in each case, Facebook is less expensive. This is an indicator that investors are expecting far greater growth from Netflix in the coming years. Based on the metrics we reviewed, Facebook is the clear winner. It's important to note that I own both stocks and expect market-beating returns from both. Over the next few years, however, I see the tide turning in Netflix's favor. Accelerating international subscriber growth will eventually eclipse content spending, producing massive cash flow and bottom-line profits. Until then, Netflix is a higher-risk stock to own. Facebook already has 2.2 billion monthly active users, having a much higher global penetration than Netflix. Therefore, its growth will slow, even considering the potential of Instagram, which just crested 1 billion users, and WhatsApp, which sports 1.5 billion. For now, however, Facebook is the better buy.